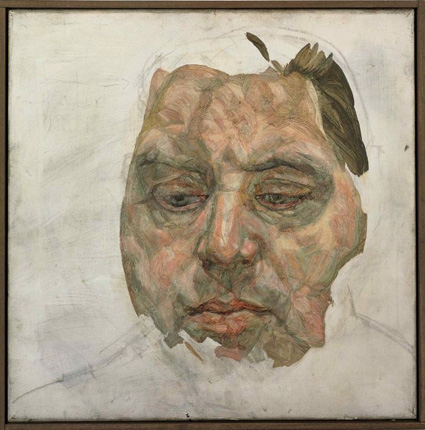 Lucian Freud’s unfinished portrait (1956-7) of his friend Francis Bacon had many in the global art market holding their breaths. Up for auction tonight at Christie’s in London, the painting was expected to fetch £7 million. Bloomberg reports that it sold for much less: £5.4 million. After lower-than-expected contemporary art sales at Sotheby’s, Frieze, and now Christie’s, dealers consider the Freud sale to be a sign of a stalling global market and a deepening financial crisis. The global art market is all but dead already, except for buyers of ‘trophy art’ whose fortunes have previously seemed unassailable. 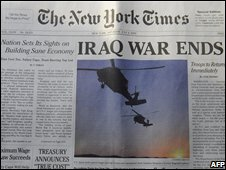 If they stop bidding, prices will plummet. Freud’s portrait was considered a harbinger for super-rich spending. The fact that it sold for less than expected (although still above the presale low estimate of £5 million) indicates that even trophy buyers are cutting back. Fasten your seatbelts. Turbulence ahead. Regular People: it’s the art material of the moment. Last week, Turner Prize winner Antony Gormley won a turn at creating a temporary public artwork for London’s Trafalgar Square. The site is the square’s empty fourth plinth, which has become both a stage for contemporary art experiments and a critical platform from which to question what constitutes a “public”. The piece is called “The One and The Other”. 2,400 volunteers will occupy the plinth one at a time, for an hour each, 24/7 for a hundred days. These human subjects individually and collectively become the art objects. It’s an opportunity to perform an act of collective creativity, people contributing one hour of their lives that represents Britain now… the exercise will present a national portrait of this time. …it will be a moment of theatre, someone lifted from common ground and made into an image when they are on top of the plinth … It will be a spectacle, but I’m also concerned about the subjects, what they learn about themselves, exposed in a public arena. Over at the Tate, another Turner prize winner Martin Creed is exhibiting his new piece “Work No 850”. 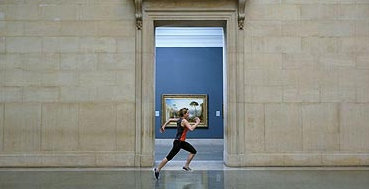 It consists of a runner sprinting the entire length of the Tate’s neoclassical sculpture galleries. The 86-metre sprints will be “performed” every 30 seconds, from 10am to 6pm, for four months. Running is the opposite of being still. If you think about death as being completely still and movement as a sign of life, then the fastest movement possible is the biggest sign of life. So running fast is like the exact opposite of death – it’s an example of aliveness. While both artists are saying that they are celebrating human-ness, these projects (and similar others) make me uncomfortable. I can’t help thinking that regular people are being turned into material objects intended for display and commodification. There’s a deep, underlying violence to these creative acts. And neither artist seems to have a clue.